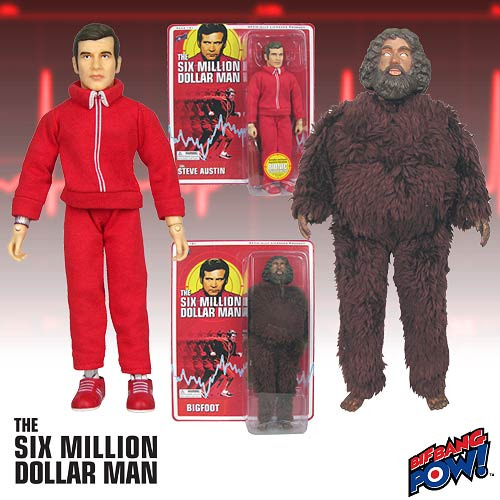 Action figures derived from The Six Million Dollar Man! Multiple points of articulation. Series-true fabric clothing. Retro styling. Each figure includes an exclusive key chain plays "bionic" sound effects! It's been a long time since the world has seen collectibles of the original Col. Steve Austin, "a man barely alive," so Bif Bang Pow! is excited to bring these 8-inch scale Six Million Dollar Man action figures to loyal fans of the celebrated TV series everywhere. Continuing Bif Bang Pow! 's successful partnership with EMCE Toys, these truly unique figures feature multiple points of articulation, series-true fabric clothing, and a retro style that hearkens to the bestselling "Mego" action figures of the 1970s and 1980s... only better than they were before... better, stronger, and maybe even faster! Ages 14 and up. Each figure comes with an exclusive key chain that plays "bionic" sound effects! Requires 3x "AG3" battery, included. Col. Steve Austin is brought back to life once more in this Steve Austin Action Figure that presents the likeness of actor and pop-culture icon Lee Majors in a bright-red outfit and shoes. This unbelievable figure even has "bionic" details, plus includes a sound-effect accessory. Standing an impressive 9 5/8-inches tall, the Bigfoot Action Figure spotlights the hulking character featured in multiple episodes of The Six Million Dollar Man. The intimidating protector of aliens from outer space includes silver-metallic eyes, a fur-like suit, and a sound effect.